Jimmy started playing professionally in 1980 with his band Masque featuring guitar wiz Vinnie Moore. Moving to Florida in 1986, he took up with Easy Excess for 2 years on nonstop gigging. Wanting to pursue Blues as his main music, Jimmy returned to the Tri-State are in 1989. He picked up a gig with Lisa Jack & The Reputations and this led to many years of work backing up Regional Acts such as Sister Blue, Jim McCarty, & The Homewreckers. In 1996, he hit the road with Blues Great Sonny Rhodes touring Europe, Canada & the U.S. It was on this tour that he met and played with many Great Bluesmen including the Legendary Frankie Lee, and would go on to back up the singer on some East Coast dates. Returning in 1997, he recorded with Randy Lippincott & began backing up Randy as well as Georgie Bonds & The Blueskeepers and Arkansas' own Lonnie Shields. Jimmy stays busy with these various artists, sometimes working 6 to 7 nights a week, but he still found time to back L.A.'s Arthur Adams at the 2000 Pocono Blues Fest and Chris Cain at the 2001 Riverfront Blues Fest. "It's been my great pleasure to play behind all these Great Blues Artists. I am truly blessed. THANK YOU ALL SO MUCH!" This is truly an enjoyable CD. I love it. And I am not just saying that! Hell, I'm proud just to know a guy who has done it so well . . . The songs are great . . . well-structured and memorable. For me, the appeal is in the varied rhythms, arrangements and instrumentation. I like 'em all, but my favorite tunes are "eat dem beans" and "goin back home." To my ears, jimmy, your songs and their production create a sonic landscape that not only tantalizes the ears with the Blues, but also makes a guy want to listen over and over again and stay in the songs as long as possible. I am a blues hound and that means I'm always looking for new blues in clubs and festivals and Cd's. 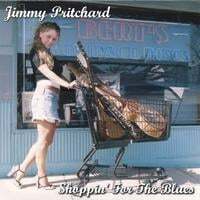 This is a great mix of styles and Jimmy is a great vocalist and surrounds himself with some great Musians to creat a very good Cd that should apeal to most blues Fans.Keep up the great work ,and when are you coming to the Bay area? Can't believe this is his first CD. All original songs, great mix of talented musicians...all from a truly experienced Blues musician--BUY THIS CD!!! Shoppin' For The Blues is my favorite cd---I love it! !